Picture profile of one of the most heavily armoured scouting tanks to be used in combat. The M41 Walker Bulldog was originally designed to be air-transportable, and the desired anti-tank capabilities were provided by installing a long 76 mm gun with an advanced rangefinder. Picture profile of one of the most heavily armoured scouting tanks to be used in combat. The M41 Walker Bulldog was originally designed to be air-transportable, and the desired anti-tank capabilities were provided by installing a long 76 mm gun with an advanced rangefinder. In 1949, with the adoption of a less ambitious rangefinder, the tank took the shape and capabilities of the now famous M41. Production started in 1951 at Cadillac's Cleveland Tank Plant, and by 1953 the new tank completely replaced the incumbent scouting tanks in the U.S. Army. Initially it was nicknamed‘Little Bulldog', then renamed to ‘Walker Bulldog' after General Walton Walker, who was killed in a jeep accident in Korea in 1950. The M41 was an agile and well-armed vehicle. But it was also flawed; being known as noisy, fuel-hungry and heavy enough to cause problems with air transport. 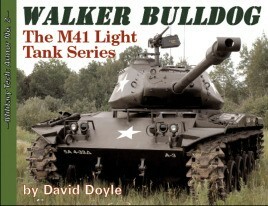 The Walker Bulldog never saw combat with the US Army. But in 1965 a number of vehicles were supplied to South Vietnam. The M41 went on to form the bulk of the ARVN Armoured Force, and played a significant role in the Vietnam War. Being too lightly armoured for most battlefield tasks, the tank was used mostly for internal security missions. On several occasions when the tank encountered North Vietnamese armour, its gun was reportedly effective against enemy tanks including the T-54. The M41 has also been exported to Brazil (300), Chile (60), Dominican Republic (12), Guatemala (10), Somalia (10), Taiwan (675), Thailand (200), Tunisia (10) and other countries. Many of these tanks were upgraded to prolong their life. Some are still in service. Thai M41s were used in the Thailand coup d'état in September, 2006.